Sony's 2010 Bravia TVs will offer 3D, Freeview HD and internet video | What Hi-Fi? Sony says three quarters of the new Bravia TV range in the UK will be fitted with Freeview HD tuners, enabling viewers to receive free-to-air high-definition broadcasts. Christian Brown, senior category marketing manager at Sony UK, says: "Sony is leading the way in this field, being the first to market televisions complete with an integrated Freeview HD tuner." As we've already reported, Sony's first 3D TVs, Blu-ray players and home cinema systems will arrive in 2010. The flagship Signature LX900 range is Full HD 3D capable straight out of the box, while the Cinematic HX900 is 3D-ready, meaning you'll have to buy the optional 3D transmitter and glasses for the full three-dimensional experience. 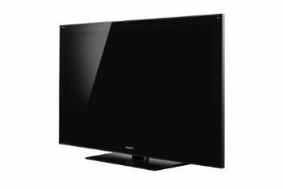 Several of Sony's 2010 ranges use LED backlighting, and many are fitted with wi-fi for access to Sony Bravia Internet TV. The latter will give access to Demand Five, a catch-up TV service from Channel Five, as well as movies on demand from Lovefilm. Owners will also be able to access social networking sites such as Twitter, Flickr and Facebook via their TVs. Lower down the TV range are the Essential models with integrated Blu-ray or DVD players. All models adopt Sony's new 'Monolithic Design' styling. For a full breakdown of the complete 2010 Sony Bravia range due out in the UK, read our special blog.